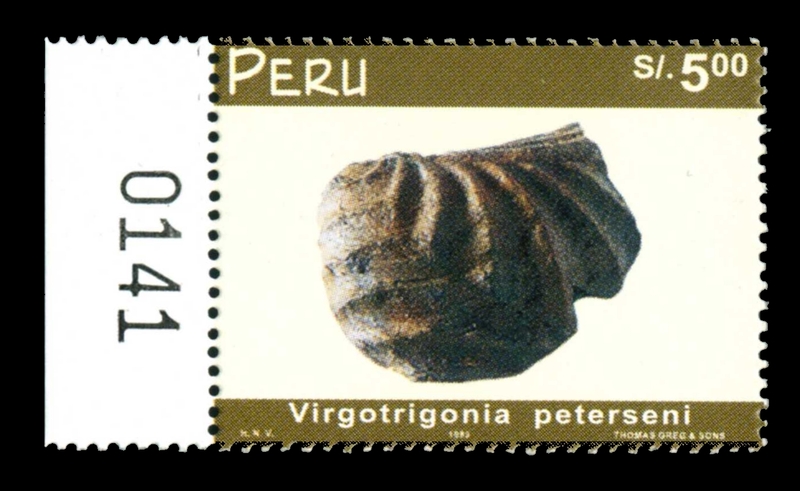 Peru 1999 "Geology of Peru"
Virgotrigonia peterseni Alleman.-Petrification of a valve of a new genus of Trigonidae, a lamellibranch mollusk of lower cretaceous (valanginian) age (135 million years). 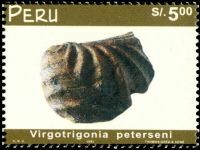 This specimen was collected and described by Vera Allerman at Cerro La Virgen, Morro Solar, in the district of Chorrillos in Lima. 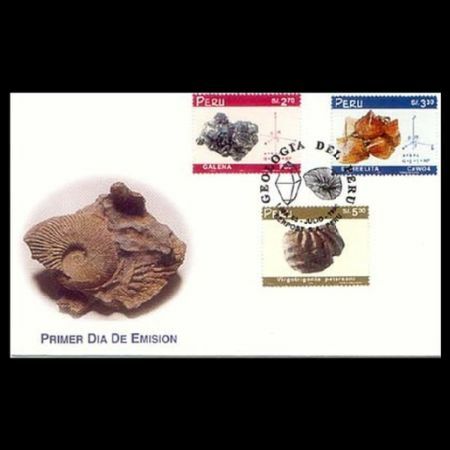 The name of the new species was given in honor of the prominent geolist Georg Petersen in recognition of his efforts which made possible the discovery and description of this new genius. Other species of this genus are known in Chile and Argentina. The fossiliferous formations at Morro Solar, Chorrillos, deserve to be protected. Vera Alleman's collection, deposited at the Museum of Natural History of the University Ricardo Palma. 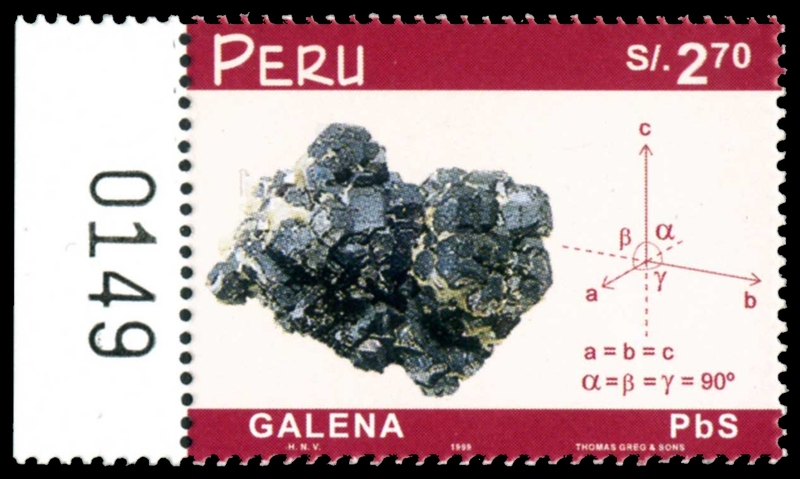 Galena.- PbS, cubic system. Location:Casapalca mine, Lima. The Casapalca mine is a producer of lead, zinc and silver ores. 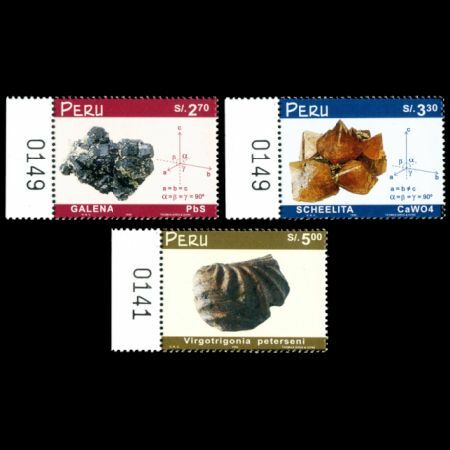 It is located 130km east of Lima, at an altitude of 4,495 m. Production of lead-zinc ores, rich in silver, dates back to Spanish colonial time and continues to the present day. The stratigraphic sequence consists of sedimentary and volcanic rocks of upper cretaceous to quaternary age. This sequence was strongly folded and intruded by various igneous bodies. The ore deposits consist of persistent veins which cut the entire sequence. 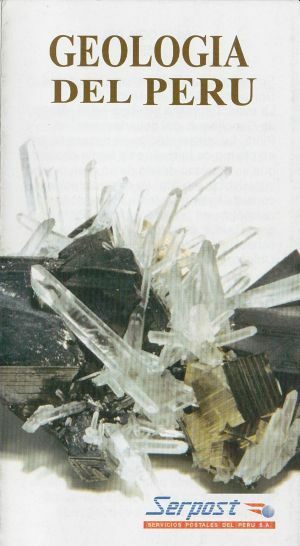 The economic minelatization consists of galena, sphalerite, tetrahedrite and chalcopyrite. Guido del Castillo's private collection. 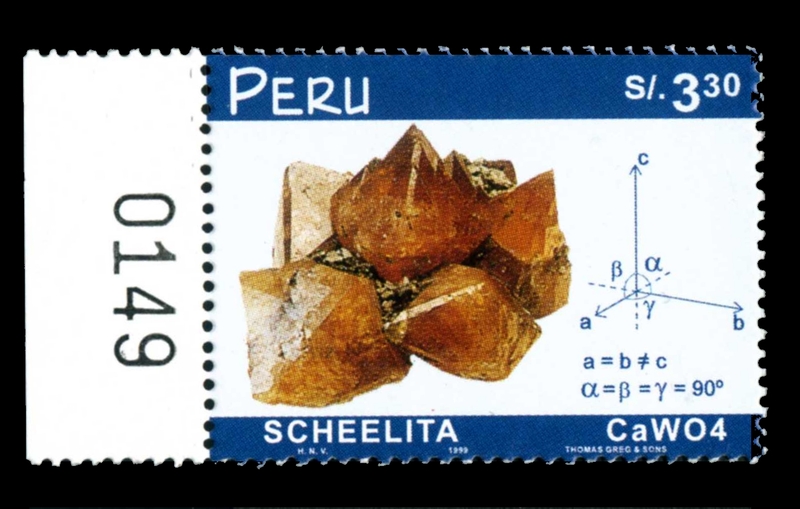 Scheelite.- CaWO4, tetragonal system. Location: Turmalina mine, Piura. The Turmalina mine is situated in the district of Canchaque, department of Piura. upper part od the deposit, with pyrite, arsenopyrite, sphalerite, wolframite and scheelite occupying the lower portion. Mr. Guido del Castillo's private collection.